Screenings take place in a variety of venues, large and small. 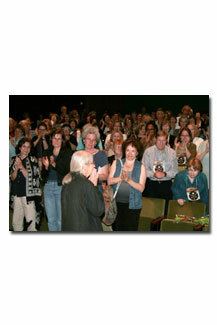 The first screenings of our documentary about Meinrad Craighead took place in 2009 in Durham and Albuquerque. Meinrad was present at each of these. To host a screening in your community, click here. You will receive as much support as you need in order to plan a successful evet. Check back later for more screenings, or contact us to set up a screening in your community. To host a screening, click here. 10-minute preview shown at Short Attention Span Shorts! July 26, 2010, 7-8:30 p.m. & July 29, 10-11:30 a.m. The film was shown at two festivals.